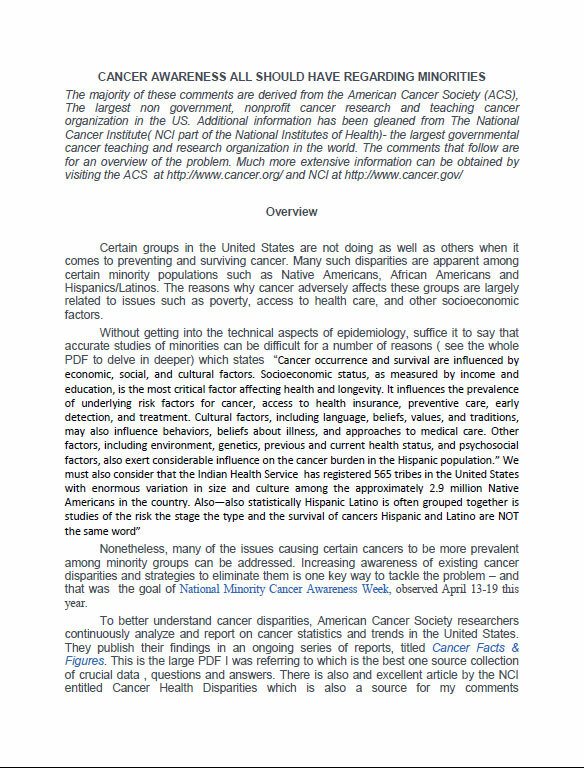 Take Home: SCREENING MAMMOGRAPHY WORKS AND EFFORTS TO GET THIS PROCEDURE DONE FOR ALL AS PER PUBLISHED GUIDELINES AND ESPECIALLY FOR MINORITIES ( SEE PRIOR POSTS BELOW RE : CANCER IN MINORITIES )http://drkevinryan.com/…/cancer-awareness-all-should-have-…/ ) IS PARAMOUNT.. WHEN YOU ARE TOLD YOU MAY OR DO HAVE CANCER-WHAT NEXT? Cancer is no respecter of persons. No one is immune to the second leading cause of death yearly affecting over 4 million patients and loved ones. The greatest blow, when tumor is the rumor, is spirit crushing waves of anxiety; fear of the unknown. Where do I go? What can I do. Serious concerns of death, pain, suffering and loss of control and dignity flood all. Yet in 30 years of practice I have never seen a coward. In fact, I have seen more than one man’s portion of joy. This magic is done by recognizing the autonomy of the patients, the need for the team building with the patients family and professional staff. Then comes the metamorphosis of the soul sucking anxiety, borne of bonafide ignorance, to fiercely inspired and informed fighting. That is what this book does. Unsolicited reviewers on Amazon went to great lengths noting how comprehensive and comprehensible this one of a kind text is. “This is not a medical text on the treatment of malignancy, per se, or just prevention, screening or cancer survivorship. This book describes what happens every step of the way and what works best for the whole team when a possible diagnosis becomes a proven and potentially fatal one. A major goal is the reduction of anxiety, marshaling internal and other resources to help those diagnosed knowledgeably face their fears and fight the good fight rs. Dr Ryan addresses many often unspoken truths that now found in one place can act as a guide for what is for many the most frightening time of their lives. A quick review of the table of contents on the Amazon site (http://www.amazon.com/When-Tumor-Rumor-Cancer-Answer/dp/1481708783) shows areas woefully lacking in other patient oriented cancer texts. Topics covered are patient autonomy, anxiety and fear. There is a broad overview of the nuts and bolts of Oncology, the personality of oncologists, what to do when suspecting the diagnosis (The Rumor) and what to do when it is a certainty ( the tumor). Treatments, toxicities, complementary and alterative medicine are all covered as are symptom control and clinical trials, the internet, pain and the future. Spiritual issues are deeply addresses as well as how to talk with cancer patients, end of life issues, ethics and prognosis. The book closes with 10 heart rending stories of patients encountered in my 30 years of academic and military medicine.